» Forum » Events & locations » Locations to play » Northern New Hampshire - any pinheads/good places to play? » Northern New Hampshire - any pinheads/good places to play? Northern New Hampshire - any pinheads/good places to play? Moving cross country to Northern New Hampshire - I know very little about the area in general and more specifically know nothing about the collector base or good places to flip the pins. I hope to make some new friends in the area, plus I’ll be bringing my rockin’ collection of 15 pins with me. Anyone out there? How far north? There isn't much of anything once you get too far up there. I was about to ask the same thing. what town specifically, might find stuff in neighboring states. Problem with funspot is condition. Plain and simple you’re going to see a lot of games with some sort of key mech malfunctioning or like a flipper that can’t hit a key ramp shot. However, if you’re willing to get down to Manchester, we got a half decent scene going. 1) Electric Avenue just opened in Manch and offers about 8 pins and they actually care about their games working. Also a good can beer selection, and wonderful owners. 2) We have some fellow Pinsiders that open their homes and (seriously awesome) collections for things like NEPL league or BPA parties. 3) You can find random pins here and there. East of Manchester there’s a Tron Pro at a burger joint. There’s an AS Pro in Concord at a bar set on $.50/play with a super generous tilt. One step south on the map you have the Southern NH Pinball Club in Nashua which has a very extensive collection from EMs to modern Sterns. Hell, even Canobie Lake Park (half decent local amusement park) has a pinball room with a ton of modern sterns and B/W titles, most with mods like colordmd. Lastly you can just make a day trip to MA. There’s Flat Top Johnnys and A4Cade in Cambridge which have meticulously maintained games, mostly new titles. There’s also Trina’s in Amesbury (similar to the Cambridge deal) and Salisbury beach (ehhhhhh... not as nice). So yeah, there’s not a whole lot up north. But get to concord-manchester... maybe Nashua and MA, and options open exponentially. Omni Mt Washington hotel across from Bretton Woods ski resort in the gameroom at the lower level. Fairly close to Franconia. They always have 2 of the newest Sterns in great shape. No need to be staying there, just park and go downstairs. I think $1 or .75c maybe a play I forget that part. I've seen GB, AS, DP, ST and others in there. They'd probably have a Black Knight Pro in there soon. A very small gameroom, 2 pins, 2 sit down drivers (Batman), Big Buck Hunter arcade game and Golden Tee with a pool table I think. They have a tech guy usually on the premises, but I get what you are saying. They're System 11s, so kind of beat up. Canobie Lake...Southern NH. Salem. Although you'd have to pay park admission. 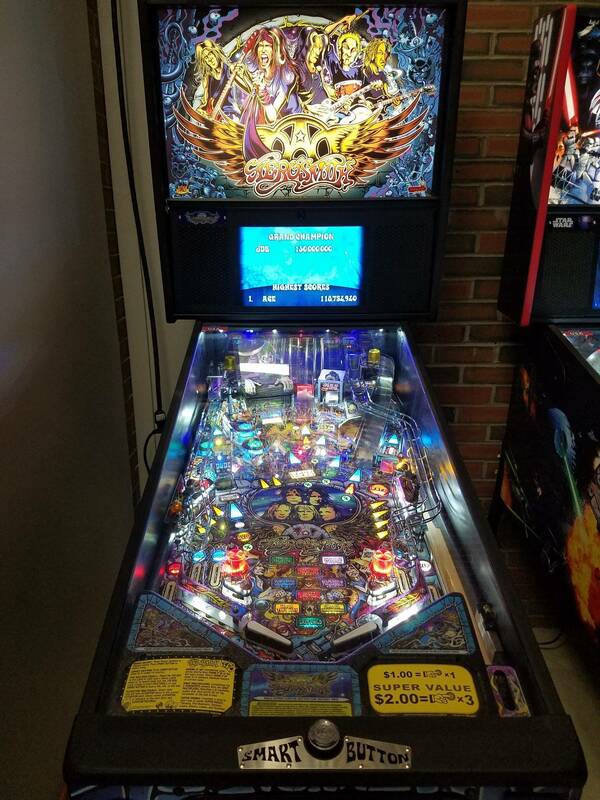 There is a Southern NH pinball group. Always see them at Pintastic. Of yeah, make sure you get to Pintastic. Funspot, and all the Weirs Beach arcades, are reasonably close to Plymouth. Super-old coin-ops, mainly for viewing rather than playing, are part of the attraction at Clark's Trading Post in North Woodstock. Thanks KozMck for the report on the Omni Mount Washington. Anyone have any sightings in the Littleton/Saint Johnsbury region? As for Canobie Lake, see the thread where I reported on my trip last year. Great information, thanks! We are a couple months away from the move, gotta wait until the kids are on summer break. I will also be opening my place to flip the pins, always a nice way to meet pinheads. I will definitely be going to Pintastic! Welcome to New Hampshire Michael. As has been said, the further North you go the pickin's get slim. I'm located in southern NH in Auburn bordering Manchester. Funworld in Nashua has about 8 pins on location, and Funspot at the Weirs has a bunch, but yes, most are beat. I did just find "To Share Brewery" in Manchester last weekend and they had an Aerosmith Pro and a Star Wars Pro both set up on freeplay. Between my neighbor and myself we have 11 pins. You are always welcome down here to play as well. Woah! Where is this dream brewery with Sterns on free play? I’m supporting Electric Avenue tonight real quick before a day at Pax East tomorrow, but between Long Blue Cat, Pipe Dream (has EMs), backyard, 603, and whatever Milly’s Is called now, I had no idea there was another taproom, let alone one with freeplay pins! BitBar in Salem, MA has 6 pins I think, I remember JJPOTC, EATPM, DI, a really nice AFM, Stern KISS and Stern ST. Assuming I have been more recently, the lineup has changed some. They still have the Jersey Jacks (every one except WOZ), a T2, Elvira, TAF, and the Stern Star Trek. Pretty sure AFM and KISS are gone. Someone needs to say it: driving across state lines is not that big a deal in New England compared to the Western states. If someone says New Jersey is "five states away" we think "yeah, that's do-able." Also, you should probably pop into every bowling alley you encounter. Some have pinball machines, and many have candlepin bowling. Even duckpins if you look hard enough. Yes sorry I meant a really nice TAF not AFM. For some reason I always use AFM for Addams family. Good catch. And you're right there was a Hobbit and T2 as well. I went there 2-3 weeks ago. I would check out Tokens Taproom where you are. Aside from that go to Maine. I mean if you want to travel south then great but where you are it's really Tokens, Maine and Manchester. They just got a TAFG of all things. If you further North towards Franconia you would be about exactly halfway between "The Pinball Co-Op" in South Burlington Vermont & https://www.facebook.com/groups/Rummex/ in Rumford Maine. Manchester NH is an hour & a half away & Portland Maine is two and a half hours. for tournament play of various types. You would fit in nicely if you would like to host tournaments at some point after you get settled-in.